Infinite Art Tournament: Element of the Month: Molybdenum! Let's start with the obvious: "Molybdenum" is lots of fun to say. Try it! Also, I encourage you to start a conversation with a sentence containing the word "Molybdenum" with the next person you encounter. Nothing but good could could come of this. I, for instance, might start a conversation by asking "Did you know my mother-in-law once lived near one of the largest Molybdenum mines in the world?" True story! Before she was married, she lived in Climax, Colorado, at that time the highest altitude human settlement in the United States. The pride of Climax was of course the "Glory Hole" of the Climax Mine, a vast Molybdenum extraction enterprise that, back in the day, produced three quarters of the world's output. Climax was however abandoned in the 1960s, having been undermined (if I recall the stories correctly) by its own Glory Hole. When Mrs.5000 and I drove through the area recently, we were impressed by its resemblance to the kinds of ghastly ruined landscapes imagined by directors of dystopian science fiction films with ecological messages. You can get a feel for the place by checking out the satellite image on Google Maps. Though no doubt the Phelps Dodge Corporation, owners of the currently mothballed operation, has the environmental situation firmly in hand. If you were paying attention to the introductory information above -- I don't mean to doubt you -- you realize that the Australian Molybdenum shown here must be pretty freaking hot. It has the sixth highest melting point among the elements, so you have to warm it up pretty thoroughly to get it all bubbly like that. This leads to its major industrial application, which is as an alloy to steel. Makes it harder and, of course, more temperature resistant, and this is considered very handy. Molybdenum is also fairly plentiful and cheap, although its price has zipped up from eight bucks a pound in 2008 to around eighteen bucks now, what with the booming Chinese steel industry. Still, it remains one of the go-to alloying metals for high-performance steel. Molybdenum was probably "discovered" in the late 1770s by Carl Wilhelm Scheele, an early chemist who also probably discovered barium, manganese, and tungsten before the people who generally get the credit for those discoveries today. Apparently the guy didn't fully grasp the significance of what he was doing, and/or didn't have much of a PR machine set up. Indeed, Scheele apparently discovered Oxygen several years before Joseph Priestly, who, as everyone knows, discovered Oxygen. Well, that's the historical record for you. In the case of Molybdenum, formal credit goes to the plucky Swede Peter Jacob Hjelm, who isolated the stuff in 1781. Toxic (like everything else) in high doses, Molybdenum is however a fairly important nutrient. If you aren't getting enough, you might be subject to tooth decay, enzymatic imbalances, and a dramatically increased risk of esophageal cancer. But unless you live in the Central Asian belt which, for some reason, doesn't have much Mo in the soil, you're probably doing fine. Please do not use the words "climax," "glory hole," and "freaking hot" in the same blog post unless accompanied by 1970s bow-chicka-wow-wow music. I'm just reporting the facts, madam. What you are looking at with those bubbles does not appear to be molten molybdenum, but rather part of the molybdenum refining process where the ore is pulverised and then mixed with a frothy liquid, The molybdenum--as an oxide--is separated from the other rock because it sticks to the bubbles. The element has a very distinctive iridescent appearance. Once you've seen it, you will recognize it again. Fine. YOU put your tongue on it. There's a reasonable chance I've done that. I was pretty young when I first visited a molybdenum processing facility, and doesn't that shiny bubbly stuff just make you want to lick it? 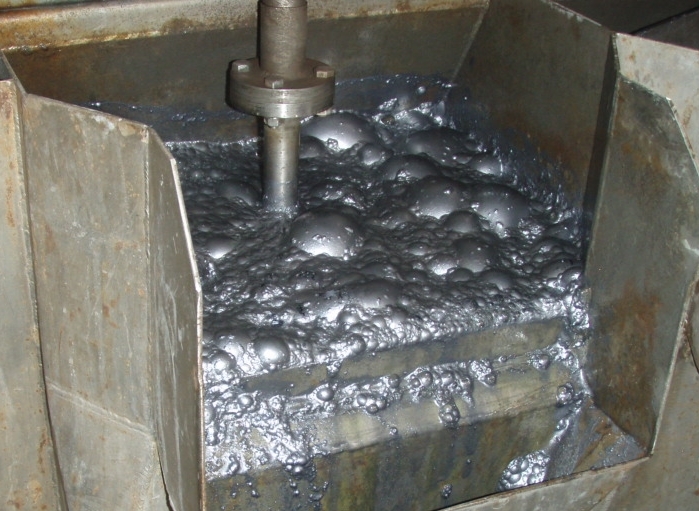 Do you imply that you continue to visit molybdenum processing facilities on a regular basis? Your theory does have the advantage of explaining why the unimaginably hot molten molybdenum would be open to the air on two sides and enclosed by what looks to be about a quarter inch of sheet metal. Nevertheless, I continue to resent being contradicted, just on principle. Once you see that shiny bubbly stuff you just have to go back. I once wrote a thesis with the word molybdenum in the title. It was incredibly bad, in every possible way. I wrote it on a pirated copy of Microsoft Word. Version 2.0, I think, it came on 5 1/4" discs and when I got writer's block (ever second or third word or so) I'd change the display colours around. About the only feature Word had back then was that you could set any colour you liked for the foreground and background. Pink on yellow was especially bad. Also my desk was behind an X-ray machine. Through some kind of administrative error I got credit for the thesis, and graduated without ever defending it. I had a heavy course load that year and honestly didn't notice that I'd never been given the thing back to correct or had a thesis defence until after I and my diploma were out of there. Also Blogger seems to have lost my corrective (to myself) follow-up wherein the bubbly process separates the molybdenum as the sulphide, and subsequent roasting converts it to the oxide. Chemical equations can be found on the Internet. Aviatrix: Have I mentioned lately that you rock?